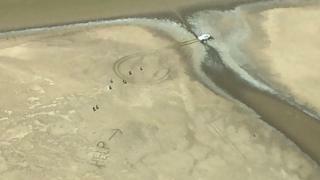 A couple have been rescued from a swamp in northern Australia after writing "help" in the mud to attract attention. "We were stuck on the marshland and we were right next to saltwater," Mr Nulgit told ABC Australia. "Earlier that day we saw two, three croc tracks - they were about five, six metres (16-19ft) long". "We tried digging and we tried putting stuff under the tires but it didn't budge," Ms Johnson told ABC. "We were pretty scared and worried, but we were just hoping someone would come." After sleeping in the van on their first night, they "grabbed everything", left the car and made camp in marshland nearby. The two - from Kununurra in Western Australia - said they had little food with them, but had packed a carton of water bottles. "It could have been a different story if they hadn't done that," Kununurra police Sergeant Dean Andrzejaczek told ABC. "I'm just grateful for everyone who pitched in and helped and came out to look for us," said Mr Nulgit in an interview with CNN. "We're pretty lucky surviving and getting out of that."